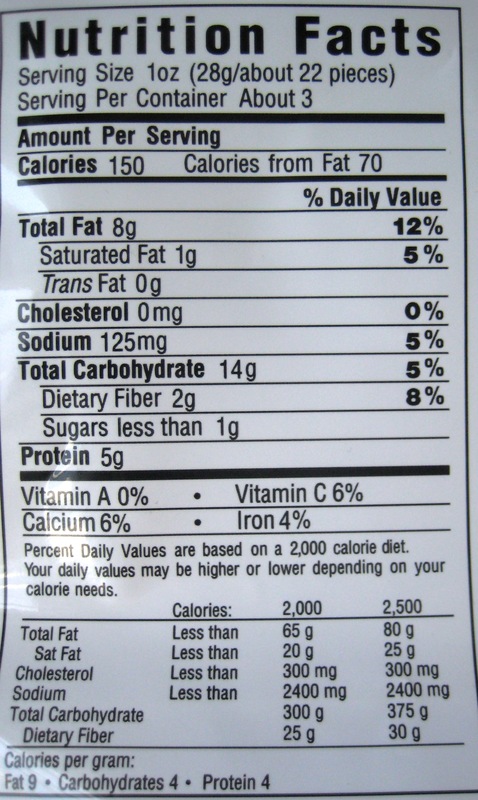 Food Labeling Lies: Are Snapea Crisps Healthy? | Healthy Eating Rocks! I think we all know that food manufacturers care more about their bottom line—money—than they do about our health. They will say just about anything to sell their products including manipulating serving sizes and making outrageous claims. Let’s take a look at one example. If you’ve ever had Snapea Crisps, you’d know they are tasty and they seem to be healthy—at least based on the claims on the packaging. But can these claims be trusted? All of these claims lead you to believe that you are eating something that is healthy and equivalent to a salad. In fact, this product is often found in the produce section of the market. I think many people believe that Snapea Crisps are puffed peas. But actually they are ground-up green peas, genetically modified corn oil, white rice, salt, and preservatives, formed into a pea shape, and baked! A review of the Nutrition Facts reveals that 1 ounce of these crisps has 150 calories and 8 grams of fat. 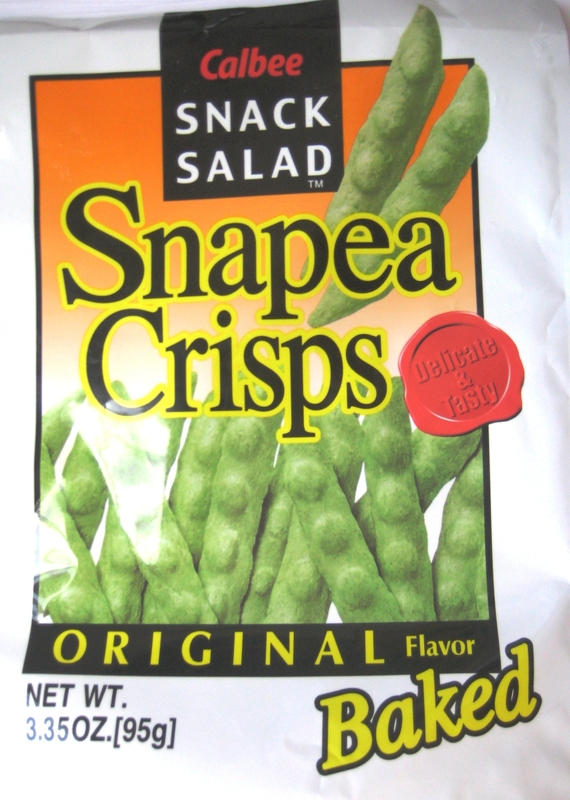 The more information I gathered about Snapea Crisps, the less they sounded like a salad. And the more they sounded like a bag of potato chips. 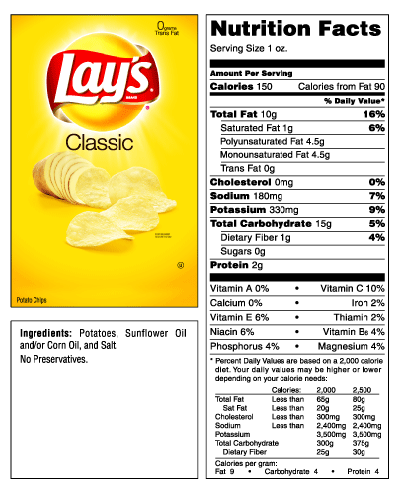 Both Snapea Crisps and Lay’s potato chips have 150 calories, similar grams of fat per ounce, and are highly processed. The difference between Lay’s potato chips and Snapea Crisps is that you know you are eating junk food when you grab a bag of chips. However, many people think they are making a healthy choice if they choose Snapea Crisps. Is there a better option? 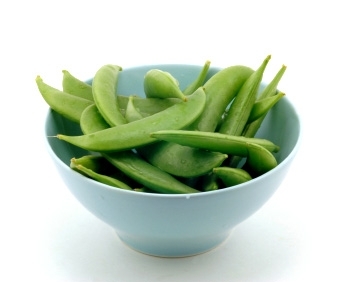 Why not try sugar snap peas? With just 41 calories for an entire cup, you can get a tasty, crunchy, low-calorie snack without any processed carbs, white rice, or calorie dense fat. The moral of this story is to pay attention to the labels and claims on processed foods. More importantly, stick with whole foods as often as you can. I love Michael Pollan’s quote from his book Food Rules, which certainly applies in this situation. See my update on Snapea Crisps here. This entry was posted in Food Labels, Most Popular Posts, Snack Foods and tagged are Calbee Snapea crisps healthy, Calbee Snapea Crisps, calbee snapea crisps ingredients, claim on food packaging, claims on food labels, food labeling lies, food labels, healthy snacks, lay's potato chips, potato chips, Snapea Crisps by Carole Bartolotto, MA, RD. Bookmark the permalink. Really enjoyed this post Carole! Thanks Martha!! I appreciate you comment. I’m hurt… thought I was doing good. Thank you Carole. Great post, Carole! I find it absolutely amazing that corporations routinely get away with this kind of dishonest labeling and advertising, but consumers have to fight to get basic information about what’s in food and other products. Thanks Rob! I agree. That’s why we have to be particularly vigilant when we see claims on the front of packages. Good! Try a yummy, real, whole food instead! Calbee Snapea crisps are gluten and gmo free, if you love these things as much as i do youll do your research on a brand thats honest with their foods. There are tons of things that are GMO free and gluten-free the really unhealthy. When you seafront a package claims it’s really like a red flag to take a closer look at the product just because they have these claims doesn’t mean they’re healthy there often highly processed processed foods the very foods we need to eat less of. I picked up a bag the other day and read the ingredients and came to the same conclusion. I’ve eaten these before but never again! I believe peas are a pretty big GMO crop as well! Peas aren’t GMO yet, but salmon, wheat, golden rice, and a few others are in the pipeline. Look out for the gmo’s there is hard evidence they are bad for you, wait err there is some unsubstantiated claims against them. Thank you! I just read this after searching to see if my favorite snack is made from gmo corn. 😦 I’m sad but wiser. Bye bye Calbee snapeas. BTW, how did you find out that it comes from gmo crops? You are welcome. This is what they say…Some US crops (corn and soy) have been enhanced using biotechnology. It is not possible for us to say which products have those ingredients. It’s likely that products with corn and soy contain biotech ingredients. The good news is Trader Joe’s brand (Trader Joe’s right on the label) sources all their foods to be free of GMOs and they have a snack very similar to Snapea Crisps. The bad news is they are still like a bag of chips so real food, such as fruits and veggies would be a better choice. Thanks for your work on this. Sorry Calbee, but “we feel” isn’t quite good enough. I want verification. And your right, fresh snapeas will be much healthier anyway. You are very welcome. Yes sugar snap peas would be better! Pingback: Update on Snapea Crisps: Are They Healthy Yet? | Healthy Eating Rocks! Thank you so much for this great information. I just bought some of these Snapea Crisps at the store yesterday thinking they were actually baked peas,…then after biting into a few I wondered where the actual pea was? They are sort of tasty, but yuck! I also am irritated that the placement for this item in the grocery store is in the vegetable section. It irritates me at how completely deceptive the marketing is with this item. There is nothing healthy about this product. Thank you again for your informative post. Thanks Gretchen. Yes, it is very deceptive. Bought some yesterday and figured they weren’t healthy after reading the ingredients and looking at the nutritional value. We loved them. Went searching for more info and found your article and needless to say I won’t buy them again. Thanks for the article. Here’s a Youtube video supposedly of SNAPEA Crisps being manufactured (extrusion process). Well, killed my apeptite for SNAPEA Crisps. Now what am I going to do with this bag…. free or organic corn oil”. 2) I’d rather get something with an omega 3 oil than yet another product with omega 6 oil. 3) I loved these so much, it made me suspicious- must be the crispy rice- I felt like I always needed them in the house-became like crack to me- so had to cut it loose! Thank you for comparing this seemingly benign snack food to crack. I have been thinking the same thing. It has been so difficult to stay away from this product especially now that Costco stocks the bigger bags ~ Ugh! Hopefully, stumbling onto this site will help me stay strong and pea crisp free. Really! Did not know that Costco sells a bigger bag. Another good reason to stay away! lol same thing happened to me. Yes it is crack in a green bag. I’m done and promise to be more careful. Back to real veggies…. Reading these posts after my family and I am addicted. Would even like to lick the inside of the snack bag. Once you cut them out, you will find you don’t even miss them! lol, you are very welcome! I found a real green bean snap snack you can get at Henry’s whole food store. They are real green beans that are dried and salted. Taste great. Great! Much better than Snapea Crisps, which are just processed junk food! ugh, I knew it was too good to be true. I bought these recently, its a new package so it doesn’t say anything about salad. But it does give the impression that its is simply baked greenpeas. My 3 yr old is very picky and seemed to like them so I thought “score!”. That is, until I ate them myself. I was like “hmmm tastes an awful lot like a chip. and how do they get it puffed like this?” and then I noticed there were no peas in the peapods which made me more suspicious and I looked it up and came to your blog. Darn. Next time Im just buying the peas. Yes if it seems too good to be true it probably is. Try real snap peas or other veggies like cut up jicama with hummus. I found a tablespoon full of oil in the bottom of the packet. 😦 I looked at the product I purchased more closely. To my dismay, this really isn’t very healthy at all. I thought it was a snap pea, but it’s just a rice puff with pea flavor “formed to look like a pea.” I could have eaten Cheetos with the calories I used for this and at least it would have kicked my Cheetos craving. Exactly! It is fake food. Eating real food is a much better option. interesting article, thank you. I was just at Costco and everyone around me was buying them, I couldn’t understand why. One lady told me for the protein and fibre! I tasted grease and saw that the ingredients are poor (2nd ingredient Corn oil, at least chips aren’t actually made with oil) and nutrition data comparable to chips. Very deceptive and not sure why they are allowed to get away with such dishonest marketing. Thank you! Yes, very deceptive, like most of what the food industry tell us! This totally changed my mind on these! Tossing the bag now!!! so in other words, they are NOT 50% less fat, a good source of fiber or lower in sodium than regular potato chips? What a lie never eat again, i loved those shape as crisps. They seem to have been overhauled, actually. I’m looking at a bag of them right now and they have far fewer calories, fat, and sodium; additionally, the bag no longer claims to be “Snack Salad.” Still not as healthy as, say, eating actual snap peas, but they’re better than they were. Snapea Crisps are sold in Japan (Calbee is a Japanese company) , and they are available in the snacks section along with chips and other junk foods. Funny how in North America they are sold in the produce section. Interesting! Thanks for you reply. I’ve eaten Snapea Crisps and thought there were delicious. But anyone who depends upon the manufacturer’s evaluation alone is misguided. That’s what the nutrition label is for. I loved these chips, but even the amount of grease left on my hands after eating them suggested that maybe there were more calories from fat than I felt I ought to be eating. They are hard to resist, so I don’t keep them in the house. I thought they were just baked peas, then I looked on the back, and it said “made from 60% real peas” Only 60%??? The other 40% is preservatives I’m guessing. Yuck. I mostly agree with what you said. although I think there is a reason for why stores put this with Vegetable section. Because the manufacture claims 70% of the snack is from Peas. I know this blog post is 3 years old, but the information is now out of date. The latest bag claims “non GMO”. The product now has 110 calories, not 150. 4.5g total fat, not 8g. 50mg of sodium, not 125mg. 4g of dietary fiber, not 2g. Compared to the types of snacks I’d normally eat ,I think the these new ones are pretty great…but to each their own. The changes they have made are like moving the deck chair on the titanic. It is your choice if you want to eat them, but don’t kid yourself and think they are healthy. A friend gave me a bag to try and they are pretty tasty. My snacks are typically nuts and whole fruits, sometimes organic corn chips from B.C. I figured these taste as good as chips so checked them out. Their website said “contains 70% real peas”. Hmmmm what’s the other 30? I tried to look it up and I wound up here. Thanks for the info, that was my first and only bag. Keep the good work. The more real info that’s out there, is more pressure we can put on changing our food supply. They’re really gross too. Not even nearly as delicious as a potato chip. Yuck. Just munch on a carrot or celery or something. These are nasty.